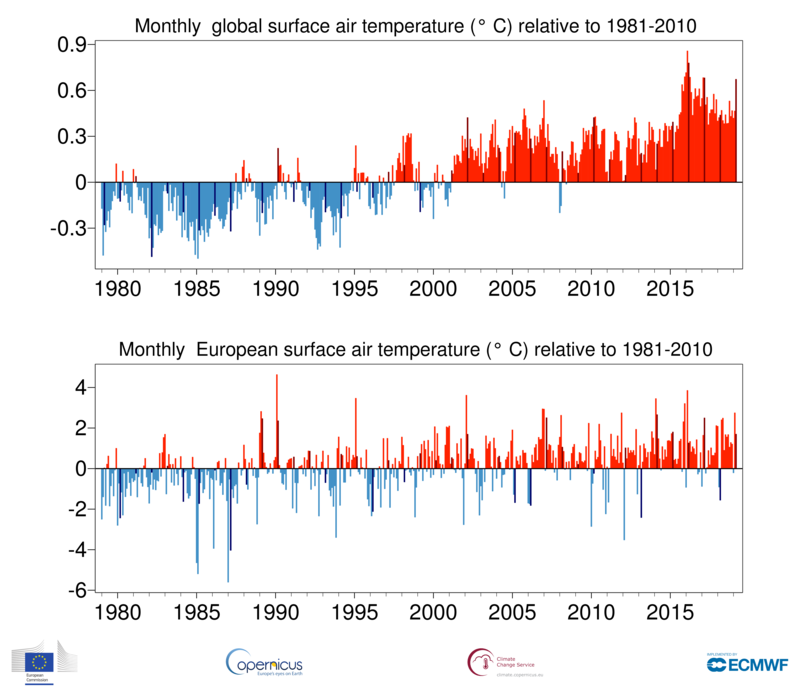 Temperatures over almost all of Europe were warmer in March 2019 than in the 1981-2010 average for the month. They were most above normal over the east of the continent, by more than 3°C in places. It was slightly colder than average over some more northern parts of Norway, Sweden and Finland. Temperatures elsewhere were considerably above average in several regions. This was particularly the case over Alaska and north-western Canada, and over central Siberia, with relatively high values extending over Kazakhstan, Mongolia and north-eastern China. Australia experienced its warmest March on record, with temperatures most above average over the state of Western Australia. Temperatures exceeded average values to a similar extent over much of southern Africa. Temperatures were also several degrees above normal in places around Antarctica, although on the whole there was a mix of regions with above- and below-average temperatures over the continent. Temperatures were substantially below average over south-western Canada and the central USA, and over much of Greenland and a region of above-average sea-ice cover to its east. Several other land regions experienced temperatures that were a little below average. Although regions of below-average temperature occurred over all major oceans, marine air temperatures were predominantly higher than average. It was especially warm compared with the long-term average over the Tasman Sea between Australia and New Zealand. below average over several land and oceanic areas, including much of Canada and Greenland, parts of the North Atlantic and South Pacific, and other parts of the Antarctic. about 0.11°C cooler than March 2016, the warmest March on record. The largest anomalies in European-average temperatures occur in wintertime, when values can vary substantially from month to month. March 2019 had a European-average temperature 1.7°C above normal. In contrast, March 2018 had an average temperature almost 1.6°C below normal. Averaging over twelve-month periods smooths out the shorter-term variations. Globally, the twelve-month period from April 2018 to March 2019 was 0.45°C warmer than the 1981-2010 average. 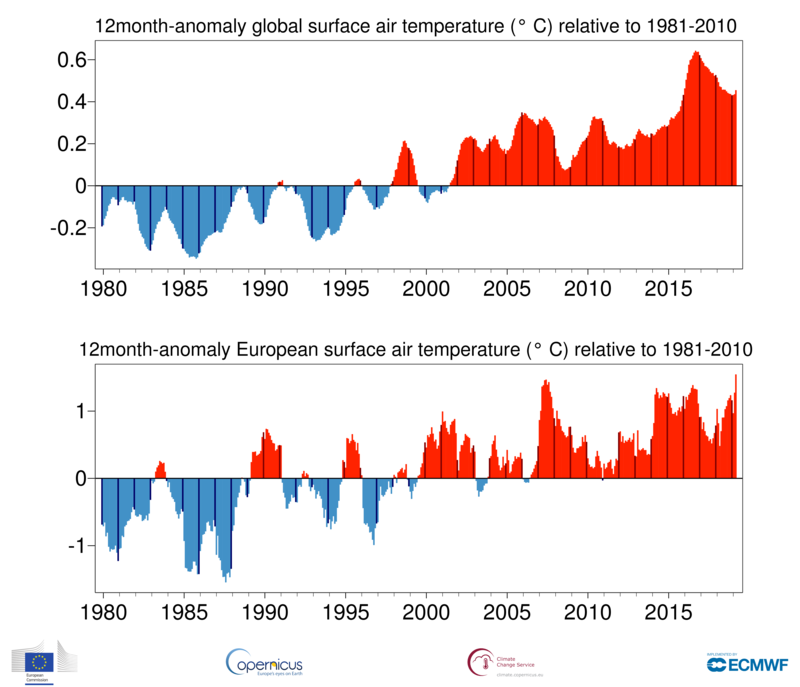 The warmest twelve-month period was from October 2015 to September 2016, with a temperature 0.64°C above average. 2016 is the warmest calendar year on record, with a global temperature 0.62°C above that for 1981-2010. The second warmest calendar year, 2017, had a temperature 0.53°C above average. The third warmest year, 2015, was warmer than 2018 by an insignificant margin: its temperature, like that of 2018, rounds to 0.43°C above the 1981-2010 average. 0.63°C should be added to these values to relate recent global temperatures to the pre-industrial level defined in the IPCC Special Report on “Global Warming of 1.5°C”. Monthly temperatures over the past twelve months have been mostly in the range from 1.0 to 1.1°C above this pre-industrial level, but March 2019 reached 1.3°C. There is more variability in average European temperatures, but values are less uncertain because observational coverage of the continent is relatively dense. Twelve-month averages for Europe were at a high level from 2014 to 2016. They then fell, but remained 0.5°C or more above the 1981-2010 average. Twelve-month averages have risen since then. The latest average, for the period from April 2018 to March 2019, is more than 1.5°C above the 1981-2010 norm. It slightly exceeds the value for the twelve-month period from July 2006 to June 2007, making the past twelve months the warmest twelve-month period on record for Europe.